1. Hit the Add custom Addon button, found on your Manage Addons screen. Your Addon Name - As it appears in the Marketplace. A Package Name - A system wide unique package name used to reference from the commandline. The Addon’s License - Choose the appropriate one from the dropdown list. Hit Create Addon to continue. Choose if you want to override the Author. If not, your registered name or organisation will be shown. You may change your Addon Name, but please note that changing the package name can have unintended side effects. Make any required changes to your License. Add a Repository URL for example from GitHub or bitbucket. Add a Project URL, but don't repeat the repository URL here. Link to your package on the Python Package Index PyPi. Link to the Addon’s Documentation (e.g. on readthedocs.org). 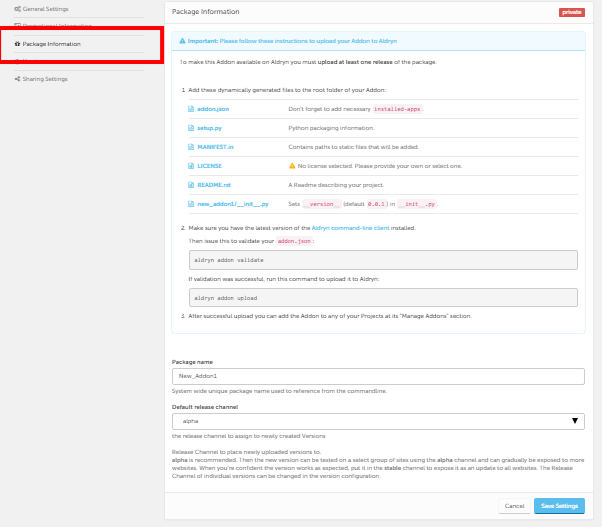 Select Package Information and check if the name and release channel are configured correctly. Follow the on-screen instructions to download the pre-generated files for your Addon. Once the files are downloaded to your computer, you can start developing your new Addon. For more information on the development process, please see How to develop a Divio Cloud Addon application. The Versions screen will list the different changes made to your Addon and their corresponding versions. Divio provides three Release channels that you can use to manage your Addons and other software. To share a custom Addon, select the Sharing Settings section of your Addon. Divio provides you with the possibility to share your Addons with others outside your own projects, by making them publicly available on www.django-cms.org and the Marketplace. Until you decide to publish it, the Addon is private and available for your websites only. If you decide to publish it, then others can use your Addon code for their own Divio projects. Important: Please note that the publication is irreversible. Once you choose to publish an Addon to the Marketplace, you cannot make it private again. Therefore, we recommend to make sure that your Addon is shareable and fully functional. Your Addon can be published among the Django CMS Marketplace Addons. To enable this, go to the General Settings of your Addon and enable the publication. Save your settings when you are ready. A License is required for publication. A good Description that helps users understand what this software is for and what it does is essential for a successful Addon. Please double check these sections in the General Settings to make sure they reflect your Addon as accurately as possible. Up to four 1280x1024 large screenshots. A Video URL - if you have a tutorial or explainer video of your Addon, you can add its URL here. 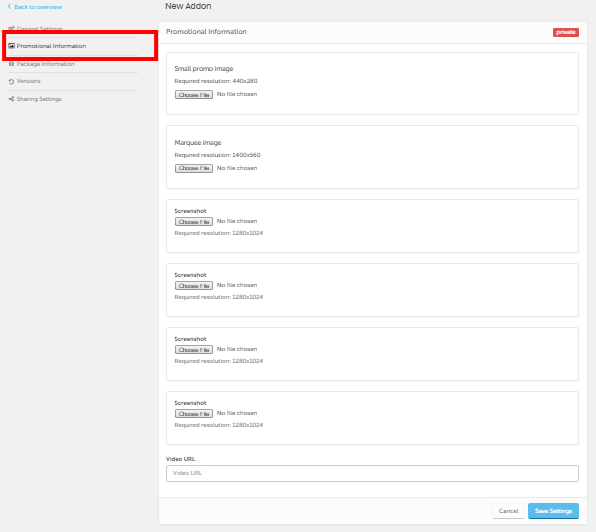 Don’t forget to save your settings once your uploads are ready.